Apple is a fruit that is loved by all. It is delicious to taste and consists of a variety of nutrients that are beneficial for health, skin and hair. It has crispy and juicy pulp and the outer skin may be of different colors. There are different varieties of apples available in different parts of the globe. Apple peels are more nutritious than the flesh of the apple and therefore you must never peel and apple. Apple is said to be 2 to 6 times more nutritious compared to its flesh. It also contains insoluble fibers. If you consume a medium apple, you will get about 4.4 gm of fiber and if you remove the peel and eat it, you will get only 2.1 gm of the fiber. Similarly Vitamin A and C are also found more in apple peel. so, never throw off the peel when you eat apple. I medium size apple peel contains 18 kcal of energy. 25 mg of potassium, a total of 1 mg carbohydrates, 2 gm dietary fiber, 1 gm protein and 1% each of Vitamin A and C. There are also other vitamins and minerals in very small amounts. It is a rich source of antioxidants as well. Thus it protects you from many diseases. Apple peel does not contain any saturated fat, trans fat or cholesterol. Apple peel is a storehouse of Vitamins A and C. According to research made at the University of Illinois, half of the Vitamin C in apples is contained in the peel. Vitamin A present in Apple peel is needed for a healthy skin and eyesight, while Vitamin C is essential for a strong immune system. It is also good for the skin. Vitamin K and folates are also found in apple peel, which are good for your proper health. Apple peel also contains another vitamin called cholin. This is beneficial for building new cells in the body. Apple peel contains copper, which is needed for the production of melanin in the body. Melanin is responsible for the color of your kin and it also protects you from the harmful UV rays of the sun. Apple peel contains biotin that helps in healthy growth of the hair. This prevents hair loss and stimulates the growth of hair, providing you thick and strong hair. Consuming apple daily helps in increasing the blood circulation in the scalp and this prevents hair loss. The occurrence of dandruff is also reduces by eating apple regularly. If you consume apples along with the skin, it will help you get relief from breathing problems. Apple peel contains a compound called quercetin, which is good for the proper functioning of the lungs. Studies have shown that people who eat about 5 or more apples in a week suffer less from breathing problems. Quercetin is also said to fight tissue damage in the brain and protect you from memory loss. Apple is also good for regulating blood sugar. The antioxidant in apple prevents the the breakdown of starch into simple sugars by retarding the activity of the enzyme responsible for it. As a result, less sugar is released in to the blood, leading to reduction in the level of blood sugar. Apple peel is good for the eyes and it is said that if you eat apple regularly, the risk of cataract is greatly reduced. Apple, being a rich of fibers, is good for preventing gallstones. Gallstone is formed when the bile solidifies when there is too much of cholesterol in it. To prevent it, you have to take diet rich in fiber. Apple is therefore good for its treatment. Chewing apple helps in providing you healthy teeth that looks whiter, as it increases the production of saliva and prevents decaying of the tooth. Apple peel is a rich source of minerals. Calcium and phosphorous are found in high amounts in apple peel. Potassium, zinc and magnesium are also found in moderate quantities. 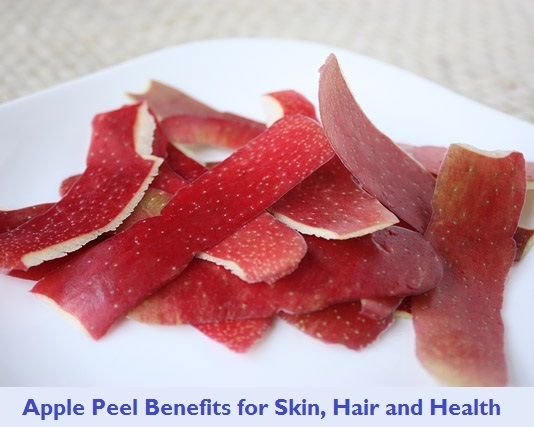 Anemic patients benefit a lot from eating apple peel as it contains iron in high amounts. Pregnant women are advised to consume apple as it is rich in folic acid and iron. You also need calcium and iron for healthy bones and teeth. Potassium improves the functions of digestive system, cardiovascular system and the functioning of cells. Apple peel is a rich source of antioxidants. Phytochemicals like phenolic acid and flavonoid are hound in highest quantities in apples. The antioxidants fight with the free radicals in the body and protect your body from the harmful reactions caused by them. They protect your body from impurities and other destructive molecules and rejuvenate your body. Apple peel is especially beneficial for fighting against the free radicals that cause various health problems and diseases. So, you must try to consume apple regularly. It keeps you away from diseases like diabetes, heart attacks and so on. According to a study conducted in the University of Illinois, apple contains compounds called triterpenoids, which can destroy cancer cells and protect your body from various types of cancers like liver, colon and breast cancers. Apple peel contains high amounts of edible fiber as well. It has both soluble and insoluble fibers. It is said that about one third of the fibers found in apple is present in its peel. Because of its height fiber content, apple is an excellent food when you are on a weight loss diet. It burns the excess fat in the body and cleanse the immune system. Consuming an apple everyday is good for proper bowel movement also as it is rich in fibers. it is good for treating constipation as well. Moreover, eating apple regularly provides you a healthy digestive system and cardiovascular system. The skin of the apple is also good for losing excess weight. This is because apple peel contains ursolic acid, which is very effective in reducing obesity.